Installing Quasar Kodi Addon: Is it Safe? Are there Alternatives? 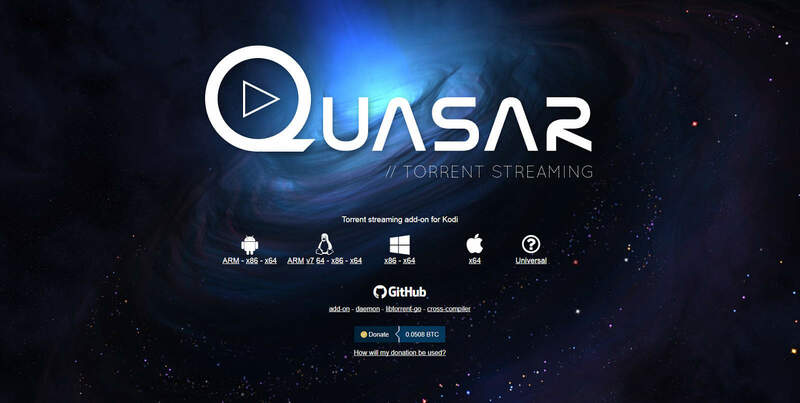 Quasar Kodi add-on: Should you install it? Is it safe and are there alternatives? We take a look at the popular Kodi Quasar Addon including what it is and if you should install it. We will walk you through privacy and security issues you should be aware of if you are considering installing this this addon and show you some great alternatives. Kodi is an open source software package which allows you to create your own home theater system in a matter of minutes. Part of its appeal is the fact that it can be installed on a wide variety of different platforms. Traditional Windows, Linux, and Mac computers are catered to, as are less conventional streaming devices like the iPhone, Roku, Raspberry Pi, USB Flash drives, Apple TV and Amazon Fire Stick. Most of Kodi’s best known third-party add-ons work in a similar way. Generally, they scrape links from various websites and deliver them to the user for easier access. However, when lots of people try to watch the same thing at the same time, it can cause the content to buffer more frequently and disrupt your viewing experience. The Quasar add-on for Kodi works differently. It allows the user to download torrents from several different providers, similar to a program like BitTorrent or Frostwire. Since these files download faster when lots of people use them, they don’t suffer from the same problems that standard streaming sites do. Torrenting isn’t illegal in and of itself, however, depending on the laws in your country, using torrents to download copyrighted content may be. It’s important you have a solid understanding of the legal issues surrounding content streaming where you are in order to protect yourself from any of the risks streaming content can bring. The first thing you should know is that Quasar is a third-party add-on. This means that it may not have been created with the rigorous and intensive validation processes that official add-ons tend to be. That said, there is no such thing as impenetrable software. Many of Kodi’s users employ a virtual private network (VPN) to prevent their internet service provider (ISP) from discovering that they’re accessing pirated content. That said, there are a number of wholly legitimate reasons that all Kodi users should use a VPN. For example, even official add-ons are vulnerable to being hijacked by malicious third parties. If this were to happen, an attacker could potentially access your browsing history, the contents of your hard drive, and even your passwords for every online service that you use. Of course, hackers aren’t the only ones interested in your online activities.Several of the world’s largest ISPs have been known to throttle the speeds of users who stream content online. This can happen even if you’re on a supposedly unlimited broadband plan and means that you might not be getting the internet speeds that you pay for. As most of us use the internet for everything from banking to business, our privacy is of paramount importance. Thankfully, there is a way to keep your online activities hidden from prying eyes. By downloading and installing a VPN, you can ensure that all of your internet traffic is encrypted. This means that anyone watching will be unable to tell what you’re doing, which not only protects you from ISP snooping, but also renders Man-in-the-Middle (MitM) attacks useless. We recommend using IPVanish. It’s a VPN service which doesn’t keep track of your activities, doesn’t sell your data, and has extremely secure encryption. Better yet, they build and maintain their own infrastructure which means that your internet speeds aren’t negatively affected. Further, it works on every Kodi add-on that we’ve tested. If your ISP is throttling your connection due to streaming content via Kodi or a similar program, it can stop this, and provide you with smoother, uninterrupted, buffering-free access to your content. What is the Quasar Kodi add-on? 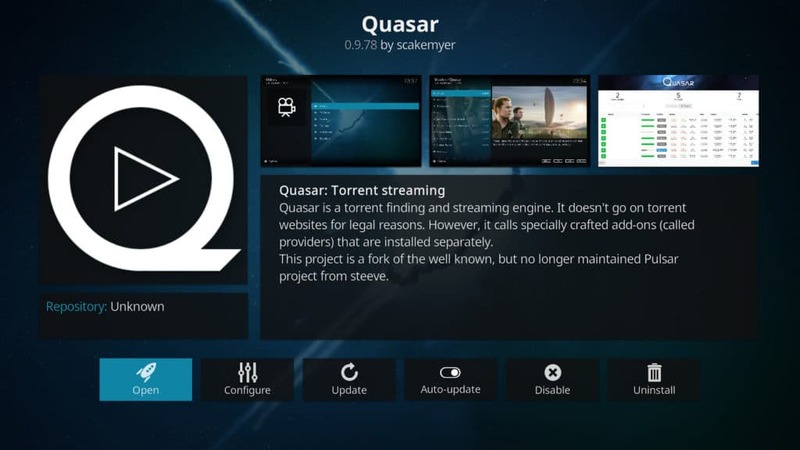 Quasar is a third-party add-on for Kodi that takes the middle man out of downloading and viewing torrented content. It accesses several of the world’s largest torrent sites and allows the user to stream content as the torrent downloads. However, torrent sites are notorious for hosting copyrighted content. The vast majority of content available is unlicensed and illegitimate, and there is no way to view only the officially licensed torrents. This is one of the reasons that these sites are often shut down or seized, and as such, there’s no guarantee that they’ll even be reliable sources. That’s not to say that all torrent sites host unlicensed content. Some focus solely on media that’s in the public domain. While the more infamous sites also host select public domain movies, these represent a miniscule portion of the total content they offer. There’s also no simple way to add a torrent provider that isn’t already in the Quasar Burst or Magnetic provider lists. Installing Quasar also comes with more risks than using a standard streaming add-on. In order for it to work, you have to allow other systems to remotely control Kodi on your computer. This is just another way in for someone looking to compromise your system, and could end very poorly for you. For the reasons above, we do not recommend that Kodi users install or stream content with Quasar. While Quasar does provide access to a huge selection of media, it’s a poor choice for people looking to stream content legitimately. The very nature of torrenting means that it’s also less secure. Thankfully, Kodi has a number of high-quality add-ons with large content libraries that are fully licensed. If it’s sporting content you’re looking for, there are few Kodi add-ons better than the ESPN Player. Not only does this allow you to watch games on demand, it also allows you view live streams, which is something a torrent simply can’t do. This add-on requires a subscription to ESPN Select, but this costs less than $10 a month, and 24-hour passes are even less expensive. There are two options available, one for college sports and another for professional level, and there’s an option in the add-on which allows you to hide the content that isn’t covered in your subscription. The content available varies by country, however, and both the US and Canada are not supported at all. Despite this, if you’re using a VPN, accessing this add-on’s content is as simple as connecting to a server in one of ESPN Player’s supported areas like Europe or Africa. 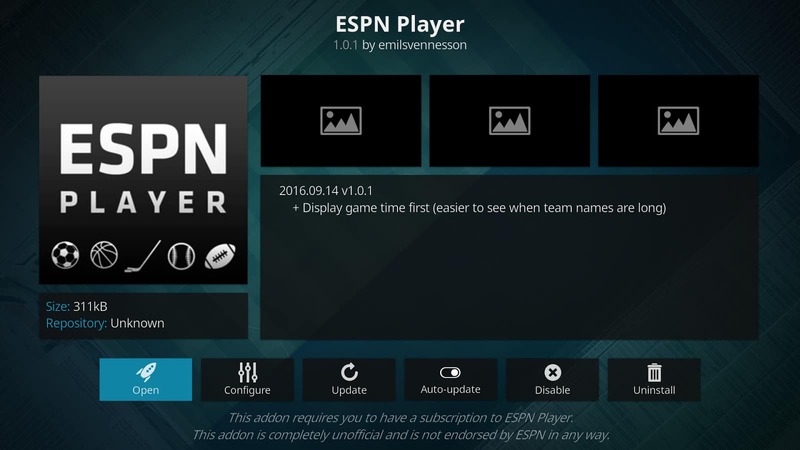 The ESPN Player is available in the official Kodi add-on repository. Anime is another highly torrented type of content. Often, classic series’ aren’t available to stream legally, or the service you use doesn’t upload the episodes as they are released. Crunchyroll, on the other hand, releases episodes just hours after they air in Japan and has several hundred shows on offer including Attack on Titan and Sword Art Online. While the Crunchyroll website allows you to view select titles for free, the Kodi add-on requires a premium membership to function.This comes with a few additional benefits, including higher quality streams, removal of ads, and no restrictions on what you can watch. Membership costs around $7 a month, so it’s a cost-effective way to watch all the anime you want. It should be noted that the vast majority of content available on Crunchyroll is in Japanese with subtitles, but if you’re looking for dubbed content, you could try out Funimation – they offer a similar experience, but have solely English language media. There’s also an add-on for Daisuki, but as this service will be shutting down in October, it may not be the best choice. 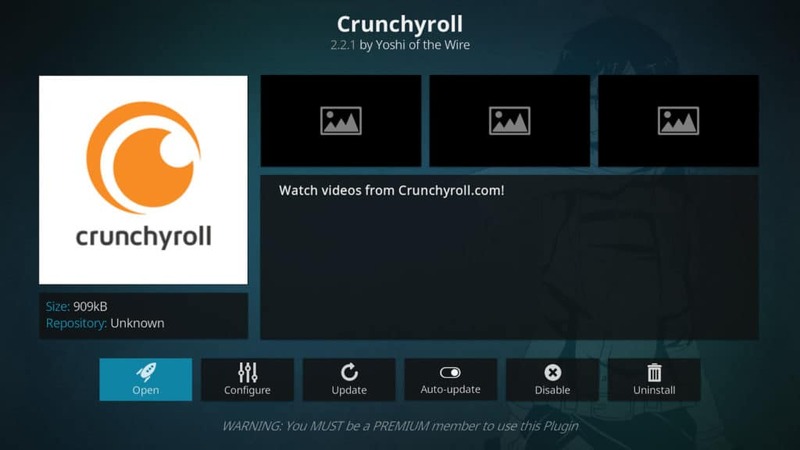 Crunchyroll can be found in the official Kodi add-on repository. The Reddit Viewer add-on for Kodi is perfect for those times when you aren’t sure what you want to watch. It pulls videos from some of the most popular video and image-based subreddits, and even allows you to customize which ones are accessed. You can even add users to this list, which makes for an easy way to browse threads that your friends have posted in. The settings menu allows for some fairly in-depth customization; it allows you to hide posts based on their content, the site they link to, or the subreddit they were posted in. It doesn’t have all of the functionality of the Reddit website (you can’t send messages or comment, for example), this add-on provides a more mediacenter-friendly way to access one of the internet’s largest user submitted content aggregation sites. 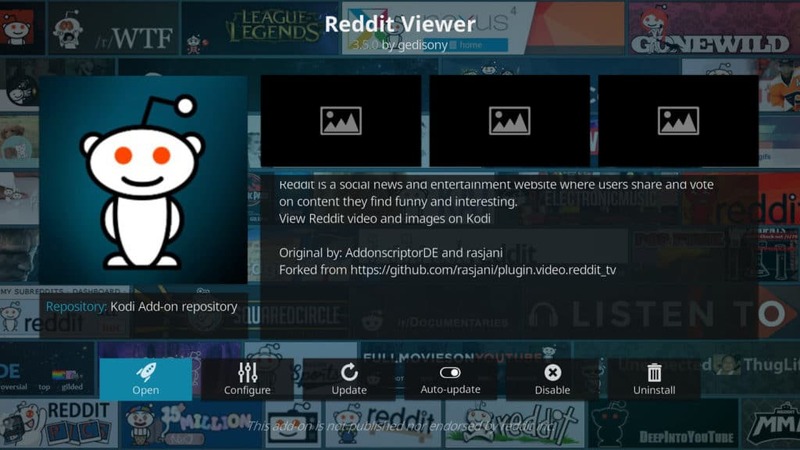 Reddit Viewer can be found in the official Kodi add-on repository. Everybody has heard of YouTube, and for good reason. It’s the world’s biggest video sharing platform, with thousands of new videos uploaded every day. Currently there are over a billion videos on the site, so there’s plenty of choice when you can’t decide what you’re in the mood to watch. In the past, YouTube only had on-demand content. However, with the rise in popularity of streaming services like Twitch, they’ve been encouraging users to start livestreaming too. You can find everything from live eSports tournaments to news coverage on here, so there’s always something to suit your tastes. The YouTube community is fairly vigilant when it comes to copyrighted content. While you can find clips of recently released movies, generally, the only films uploaded in their entirety are in the public domain. 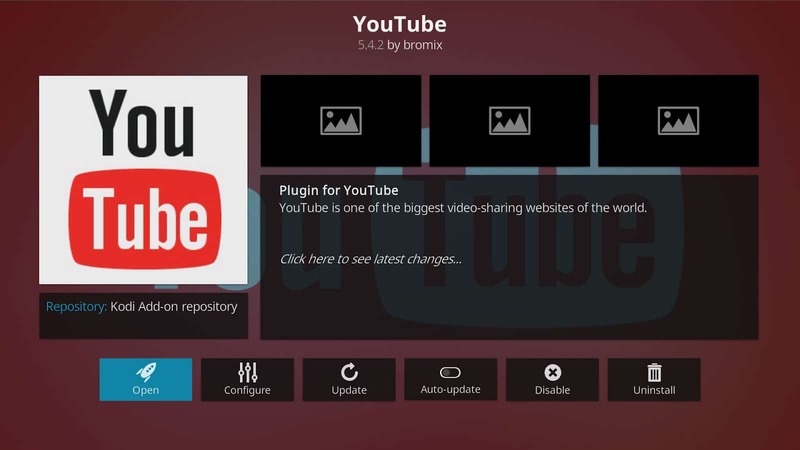 The YouTube add-on can be found in the official Kodi add-on repository. Filmrise are a company which distributes hundreds of independent films and even some more widely known TV shows like America’s Dumbest Criminals. 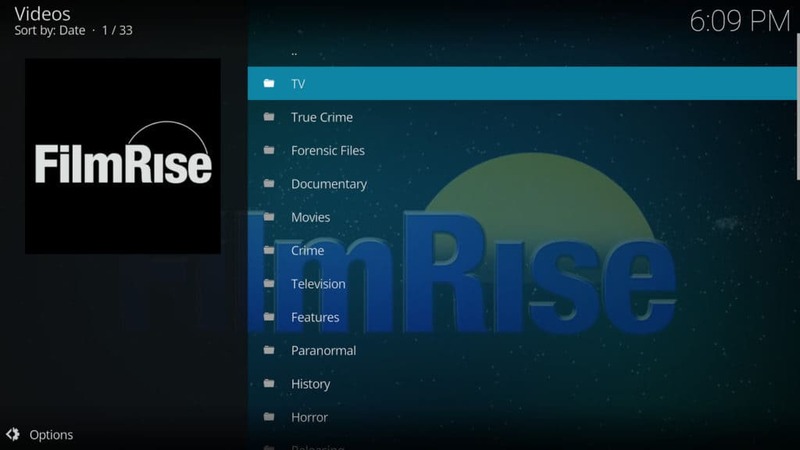 There are two Kodi add-ons which deliver FilmRise’s content, one simply named FilmRise and the other named Filmrise – Youtube. The first of these add-ons offers just six TV shows, however the latter also pulls the content from their YouTube channels, so it has a far larger content library. While you aren’t going to find any blockbuster movies here, its content is of a surprisingly high quality, and spans multiple genres. If you find FilmRise’s content not to your tastes, don’t worry. We’ve created a guide to some of the best Kodi add-ons which focus specifically on movies. The only real issue with this add-on is that there’s no search functionality. Since some of the content exists in multiple categories, it occasionally means scrolling through several pages of results until you find something you’d like to see. You can always sort the results by different criteria if you find this annoying, though. FilmRise – Youtube can be found in either the Indigo add-on installer or the MetalChris repository. iPlayer WWW is a Kodi add-on which allows you to access both live and on-demand content from the BBC’s iPlayer. Users in the UK will require a TV license in order to watch legally, but other than that, there are no requirements (such as additional fees or account creation) to stop you from catching up on some of the BBC’s best loved shows. If you’re outside of the UK, you won’t be able to view any of this content unless you use a VPN. It will still ask you if you have a TV license, however entering your details is entirely optional. All of the streams on the iPlayer are of very high quality. They load quickly, rarely stop to buffer, and best of all, there’s a wide variety of different genres. It isn’t just for streaming video, either: there are dozens of regional radio stations that you can listen to. 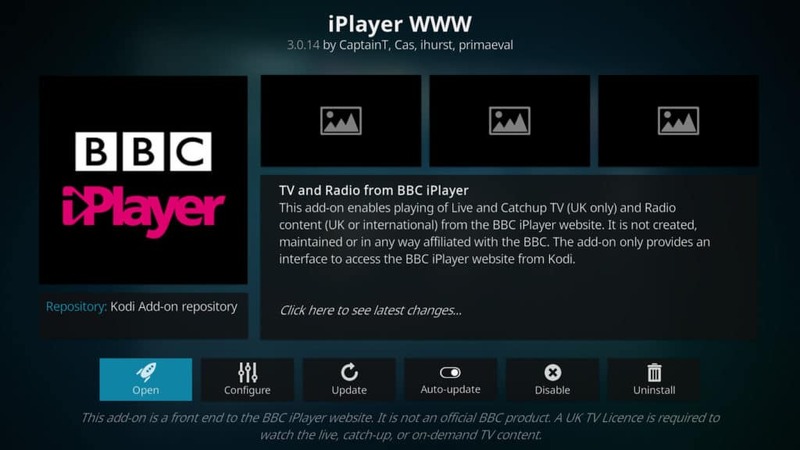 iPlayer WWW can be found in the official Kodi add-on repository. Quasar does offer access to a huge range of media, but even putting aside concerns about the amount of it which is pirated, the way in which it accesses this content is cause for concern. When you download or even seed a torrent, you become a file sharer, which has the potential to get you into trouble. If you do intend to use torrent-based add-ons for Kodi, using a VPN is more important than ever before. Without a VPN, whenever you download a torrent, your IP address will be visible to anyone who cares to look. We’ve covered the risks of torrenting before, but one thing is clear: there are easier, safer ways to access legitimate content using Kodi than by using Quasar. Hi, can you suggest an addon to Watch movies dubbed in Portuguese?